This week’s creation of Americans for Carbon Dividends, a campaign created by former Senators John Breaux and Trent Lott, shows growing momentum for a serious bipartisan discussion about pricing carbon pollution in the United States. The initiative supports a carbon dividend plan proposed by the Climate Leadership Council (CLC), which would set a price of $40 per ton of carbon pollution. Its endorsement by former Federal Reserve chairpeople Ben Bernanke and Janet Yellen, in addition to major corporations from Allianz to Exelon to First Solar, reflects the fact that securing a strong economy and addressing climate change can go hand-in-hand. These events build on growing interest in carbon pricing at the state level, with more than one-fifth of U.S. states considering bills on carbon fees and dividends in the last year. The Massachusetts Senate just passed a carbon-pricing bill in mid-June. Establishing a national carbon tax is no small undertaking. It requires careful consideration of how it can benefit all Americans (including low-income households), advance U.S. economic interests and deliver concrete benefits for the climate. WRI developed a body of research on pricing carbon that offers guidance for how an effective carbon tax can be a boon for the American economy and help rather than hurt consumers and businesses. Our new paper explores how an effective carbon tax can ensure that emissions-reduction targets are met. A carbon tax sets a predetermined price for emissions of climate pollution, letting the market decide how to respond and ultimately determine how much emissions will be reduced. This differs from cap-and-trade programs, like the successful Regional Greenhouse Gas Initiative in the Northeast, which sets a cap on carbon emissions from power plants and lets the market set the price. Some have concluded that when it comes to benefiting the climate, carbon taxes don’t provide certainty on the magnitude of emissions reductions. However, as we detail in the new paper Achieving U.S. Emissions Targets with a Carbon Tax, this does not need to be the case. The best start for ensuring a carbon tax delivers on emissions reductions is to set the initial price high enough to prompt increased investment in low-carbon fuels, technologies and infrastructure. Modeling shows that a strong national carbon tax would significantly decrease U.S. greenhouse gas (GHG) emissions. The Stanford Energy Modeling Forum found that various escalating carbon taxes with starting prices between $25 and $50 per metric ton in 2020 would achieve the U.S. GHG emissions target of 26 to 28 percent below 2005 levels by 2025. In A Winning Trade, CLC finds that its proposal can deliver about 32 percent below 2005 levels by 2025. Emissions could drop well below these estimates. As discussed in a previous WRI paper, models tend to be conservative, focusing only on the emissions reductions that are virtually certain to take place under a carbon price. Models are generally less adept at capturing other emissions reductions driven by innovation, so they tend to underestimate potential emissions reductions and overestimate the costs of action. Providing a streamlined legislative or administrative process for modifying the carbon tax over time based on new information. In addition, we need complementary policies to address global warming pollution not covered by the tax. While duplicative regulations should be avoided, complementary policies, including energy-efficiency standards and infrastructure investments, can also help support low-carbon innovation and secure energy savings for consumers. 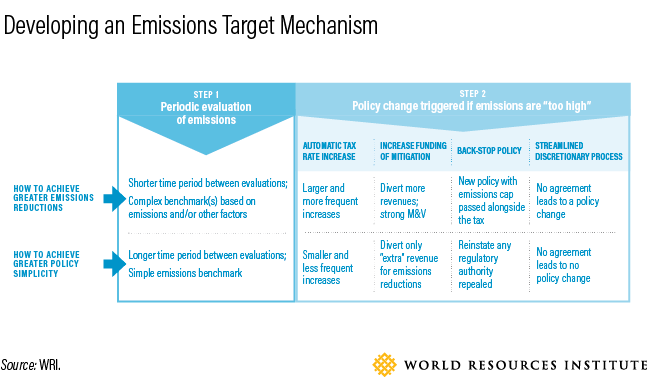 Such complementary policies may make it easier to meet emissions-reduction targets without an emissions-reduction mechanism. By starting with a strong price signal, such as the CLC’s proposal of $40 per ton, it is likely that an emissions-target mechanism will be unnecessary. In that way, the mechanism acts like an insurance policy – it’s there “just in case,” ensuring the desired climate benefits from a carbon tax are fully achieved. A strong carbon tax with an emissions-target mechanism offers the greatest potential for designing a national climate strategy that is both environmentally and economically sound. We look forward to collaborating with CLC and U.S. policy-makers to advance a climate solution that bridges partisan divides, grows the economy and effectively addresses climate change.